American Neilson Powless will end his first season in the WorldTour this weekend with roughly 65 days of racing under his belt. NANNING, China (VN) — American Neilson Powless is completing a dream. He always wanted to be a professional athlete, and his first year doing so ends at China’s Tour of Guangxi. The 22-year-old is racing through China in LottoNL-Jumbo’s yellow colors and gaining experience to add to his 2017 debut at the WorldTour level. “This is the dream, what I was trying to accomplish for a long time without even knowing it,” Powless told VeloNews. His teammates joked as they prepared for stage 3 in Nanning, a city of 6.9 million. The roster also includes first year WorldTour professional Sepp Kuss. “This is a relaxed team, we have a lot of success with that mindset,” Powless continued. Kuss won the Tour Utah and raced the Vuelta a España, which was a rare exception for the team to allow a first year rider to participate in a grand tour. Powless showed promise all the way through 2018, including a stunning ride over nearly 300 kilometers in the Milano-Sanremo Italian monument. “I’ll keep improving day in and day out, getting the most out of myself. The team had done a really good job of developing riders, you have to trust the team and I did a really good job with that. And I’m having fun with it at the same time,” he added. Powless raced several WorldTour events like Milano-Sanremo and the Critérium du Dauphiné this season. He also helped his squad win the team time trial at the Tour of Britain. 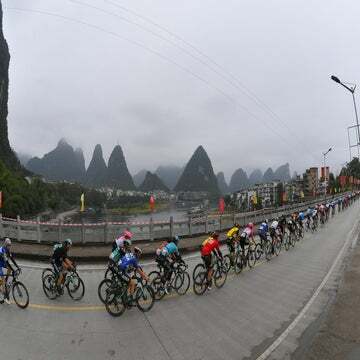 The Tour of Guangxi will wrap up Sunday, which means Powless will have raced for roughly 65 days this year. “It’s been a pretty long one, starting in January and finishing in October. My longest season to date. I’ve learned a lot,” Powless said. “The team has done well in preparing me on how to fuel myself and training me to prepare for longer races. It’s more mentally challenging than physically. “It’s about learning the lifestyle and getting used to it. Learning how to prepare for races properly than be smashing them all year. In your first couple of years, at least, I think it’s difficult to do that. You have to be real with yourself and make sure you are fit for the races where you are expected to perform.